The face of Nintendo’s Nindies showcase has revealed he’s jumping ship to greener shores. 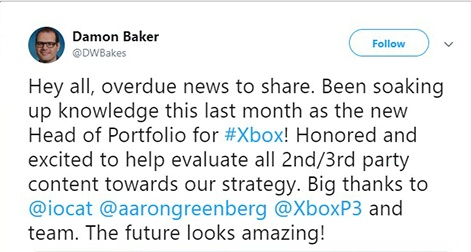 Damon Baker announced via Twitter (below) that he has taken on a role as head of portfolio for console rival Xbox. He’ll be fulfilling a similar role at Microsoft as he did for Nintendo, managing engagement efforts with third-party developers. Baker spent 12 years at Nintendo, with his most recent role seeing him advocating for indie and external developers. 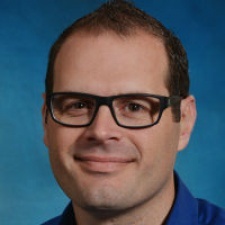 He joined in 2006 in a brand licensing role, moving to oversee marketing and communications on third-party games between 2009 and 2016. That was when he shifted to heading up Nintendo's partner management business. He is said to have been responsible for the Nintendo Switch’s big indie push on launch, following widespread criticism of the Wii U’s lacklustre third-party support. While Baker’s efforts will likely largely focus on the Xbox as a console, the wider Xbox ecosystem has reaffirmed its commitment to bringing back PC focus. Xbox head Phil Spencer believes Microsoft’s gaming brand has “a ton of work to do on Windows”, while the next in Xbox’s flagship Halo franchise will treat PC as an equal to console. Baker will work closely with Spencer, [email protected] director Chris Charla and Xbox Games Marketing general manager Aaron Greenberg in pushing second- and third-party developer efforts at Xbox.